A project is defined by start and end dates, but project success is determined by how well you manage the project life cycle. Most projects today are managed with project management software, and there are many tools and apps that help you move tasks along to completion, but they don’t really help you through all the phases of your project. And as different as each project can be, whether big or small, they all share a similar pattern. 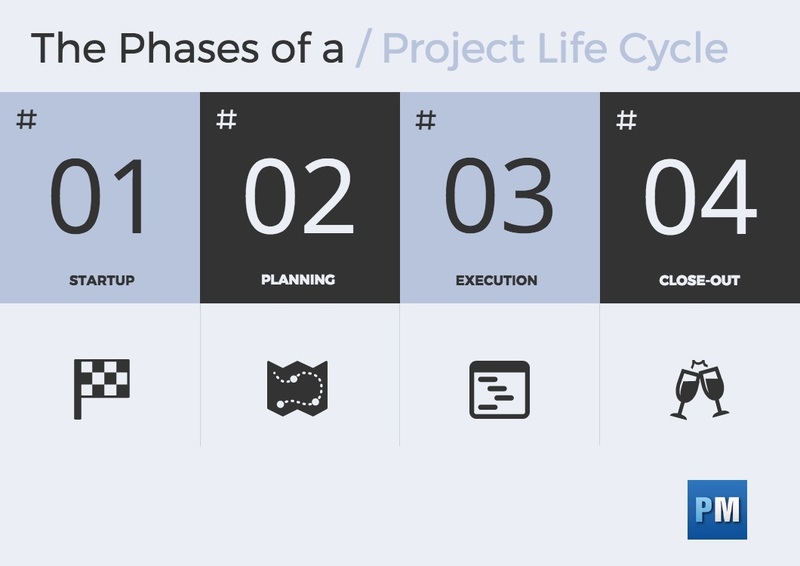 The project life cycle is essentially the different phases of a project. There are four phases to each project: start-up, planning, execution and close-out. Each of these phases can be broken down into smaller tasks, of course. However, if you want your project to succeed, then you need to know the details of each phase in a project’s life cycle. The first thing you want to do when kicking off a project is have a project manager to run everything. Most likely, that’s your job, but if not, designate a point person to lead every project. Now comes the harder part: you need to get the project approved. That’s going to take writing a project charter and business case where you outline the return on investment that makes the project viable and define the project’s objectives. Next, you figure out your project scope and then you develop a budget that will pay for everything. While taking these practical steps, you also have to think ahead and determine what the project risks are and, if they do in fact come up, how you will resolve them. Finally, you want to list all the deliverables. But that’s not all for this phase in the life cycle. Now you have to focus on the team. Begin by appointing a project sponsor and assembling a team. At this point you need to identify all the stakeholders and create an organizational chart to define everyone’s role and responsibility. That includes supplies, creating contracts for them, and developing a communications plan and setting a meeting schedule. The last part of the first step of you project is selecting the project management software tools that you’ll use. Then you’ll set up accounts for the team, online documentation systems and making the task lists and schedule to begin laying down the groundwork for the next phase, planning the project. The project plan is the document around which your project is managed. This is where you describe the major phases that will be undertaken to complete the project, starting with the scope, which is also part of the project charter. An introduction to project planning follows. You want to break down the project into milestones, basically any major event in the project, from when you put together your team to the completion of the tasks that make up a phase of the project plan. You’ll also want to set the phases of your life cycle here in the planning phase, as everything needs to be accounted for in the planning. These activities can then be broken down to a set of tasks needed to complete them. Naturally, the next step is to define these tasks and the effort necessary to get them done. For each of the tasks you have identified you now have to allocate a resource needed to complete that task. And lastly, you want to summarize the schedule of each of the phases and activities you have already defined. With this done, you’re ready to get to work, which is what’s called the execution of the project. Now you need to get those deliverables that you identified early through the door. During the production of those tasks, you’re going to monitor to better control the outcome of your project. That means applying quality management to insure that what you’re doing is up to the standards you set. You’ll also need to keep watch on your team and make sure they’re not falling behind schedule or being blocked by other team members not completely dependent tasks. Time management is how you keep your team productive. There are many ways a team can be wasteful with their time. It’s crucial that you monitor and respond quickly. Look for project management software that helps you manage through the entire project life cycle. Of course you’re not only managing teams, but all elements of the project. Here’s where you have to apply both cost and risk management to make sure you have the money and that nothing is going to blindside the project off-track. Issues are on your radar, too. They’re different than risks in that they are problems that are happening and demand immediate attention. Throughout all of these processes you’re going to be responsible for reporting back to your sponsors and stakeholders as well as team members. It’s during this phase of the project life cycle that your communications plan is going to be most important. This is the busy work. Once you’ve completed a project, you can’t move on to the next one without dealing with all the loose ends. That means closing out all your contracts, making sure the team and vendors have all been paid and getting that paperwork signed and filed away. Another thing you’ll want to do is have a postmortem with the team. Get their feedback. Find out what worked and what didn’t, so you can repeat the successes and avoid the pitfalls for the next project. Reviewing a project is a great way to turn experience into actions that help you learn and grow, as well as helping your team, many of whom you’ll likely be working with again. Don’t forget to celebrate. You’ve worked hard, and so has your team, you all deserve some time to revel in the project’s success. This is important. It’s not just a party, but a way to build team loyalty and raise morale, all dividends that will pay off when you work with these people again. ProjectManager.com is the only software designed with the entire project life cycle in mind. Manage vital project documents online, create project plans with online Gantt charts, collaborate with stakeholders and your team, and monitor your projects in real-time. Start your free trial today.